The 2017 Pan-Pacific Convention website is now open and ready to accept registrations for both the Convention and the Harmony University which will immediately follow the Convention. This promises to be one of the most exciting Barbershop Conventions and Harmony Universities ever held in the region. Aside from the anticipated high level of performances and the rare fellowship opportunities it will provide, highlights will also include the amazing, just completed, performance venue and the exciting Darling Harbour precinct surrounding the centre. 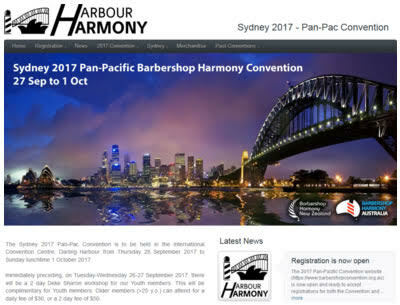 In addition to the Pan-Pac competition, both BHA and BHNZ will be concurrently holding their respective National Competitions including Australian and New Zealand open, seniors, mixed and youth barbershop choruses and quartets all sharing the same stage in a series of competitions promising to be the most inclusive convention ever. How about jumping online now and registering? Oh, and by the way, don't forget to check out the great accommodation on offer. Don't leave it to the last minute and find all the good locations booked out.